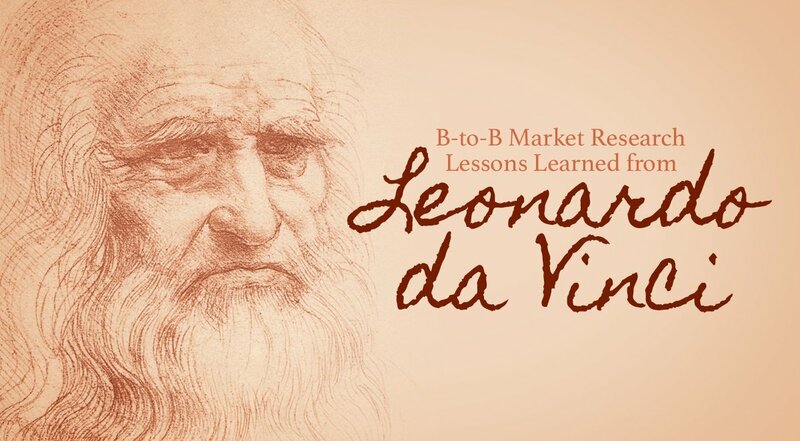 What can market research learn from Leonardo da Vinci? The best B-to-B Market Research, at its heart, fills knowledge gaps across the spectrum of business decisions using empirical methods. This elite form of research distinguishes itself from secondary research and Google searches because it has a defined scope, has a defined population, and describes the methodology and process used to create the results. The best B-to-B research methodologies have proven themselves over time as the results can be recreated. Leonardo da Vinci invented the empirical methods that the best B-to-B researchers use today, and we can use parallels between Leonardo’s thinking over 500 years ago and today. Leonardo Da Vinci, by Walter Isaacson, gives us some sage advice on how we can emulate and find inspiration from one of the greatest innovators in history. The best B-to-B business researchers are everyday ethnographers. “As you go about town,” he wrote in one of them, “constantly observe, note, and consider the circumstances and behavior of men as they talk and quarrel, or laugh, or come to blows.” We’ve found that the research process never ends for the very best project managers. Looking, watching, and observing your target audience never goes away and in fact, often complements ongoing research projects. The best B-to-B business researchers create their surveys with their client company’s CEO in mind. “Leonardo, with great fanfare, was brought to the duke to play for him, since the duke had a great liking for the sound of the lyre, and Leonardo brought the instrument which he had built with his own hands.” Leonardo recognized early on that to get widespread support and financing; he merely had to entertain and build products, for the duke. All B-to-B business leaders are the salesman, and they recognize the complicated relationship amongst users of their products, and the ones who pay for those people to use them. Your product must appeal to both. You can’t build products just for CEOs. Otherwise, they’ll never get used. And you can’t create products that appeal only to users because the specifiers will never specify them. The best B-to-B business researchers recognize the critical importance of body language. “But even though Leonardo did not consider physiognomy a science, he did believe that facial expressions indicate underlying causes.” Leonardo, indeed, may have been the world’s first qualitative research expert. A professionally trained focus group moderator will notice body language first, words second. Unfortunately, too many people stumble into a role of moderating and fall victim to creating unstructured focus group reports, which rely on dictation verbatim from the alpha in the group. The ill-trained moderator doesn’t moderate at all, doesn’t give participants a chance to participate, and the client ends up parading around saying “focus groups don’t work.” Leonardo, along with top-rated focus group moderators, gets it; facial expressions and body language say everything you need to know. The best B-to-B business researchers focus on product quality questions. The Mona-Lisa was painted on “a thin-grained plank cut from the center of a trunk of poplar.” Poplar, often considered the “hardest softwood” stands up well to aging and performs particularly well over time with oil-based paints. Leonardo’s choice of wood ensured the Mona Lisa would last many hundreds of years. B-to-B researchers know that questions on product quality, and longevity, are vital to ensuring successful launches and maintaining satisfaction. The best B-to-B researchers collaborate with other experts. “Vitruvian Man was produced after sharing ideas and sketches with friends.” While it seems that Leonardo’s collaboration was with “friends,” it is important to note that his “friends” were in fact highly esteemed and trained artists. The same goes for B-to-B research; your participants must have a high level of subject matter expertise. Just sending out surveys or creating MROCs of consumers just to check the box “collaboration” will result in an unmitigated disaster. Take the time to collaborate with people who can contribute in a thoughtful way to your research. The best B-to-B researchers seek knowledge for its own sake. “By allowing himself to be driven by pure curiosity, he got to explore more horizons and see more connections than anyone else of his era.” While Leonardo expanded his knowledge to the entire natural world around him, the best B-to-B researchers immerse themselves in their target industries. Having a profound curiosity into the inner-workings of an industry can uncover jargon, mannerisms, hot spots, and key players not otherwise available or readily understandable to the general public. The best B-to-B researchers smile. “And finally, there is the Mona Lisa’s most mystical and engaging element of all: her smile.” There you have it, folks. The most famous painting in the western hemisphere is a lady smiling. Not a moronic “look at me” selfie smile, but a real and genuine one, one that encapsulates the essence of life, business, and the universe. People can surprise us; they change, they purchase for one reason today, then another tomorrow. They find particular styles fashionable at one moment, then they move on to something new – often before you’ve had a chance to capitalize on the first trend. New technology can change everything in an instant. Great B-to-B research ultimately should bring an element of timelessness, just like Leonardo da Vinci’s work and methods have lasted many centuries. Isaacson, Walter. Leonardo da Vinci (Kindle Locations 1737-1739). Simon & Schuster. Kindle Edition. Isaacson, Walter. Leonardo da Vinci (Kindle Locations 1894-1895). Simon & Schuster. Kindle Edition. Isaacson, Walter. Leonardo da Vinci (Kindle Locations 1909-1910). Simon & Schuster. Kindle Edition. Isaacson, Walter. Leonardo da Vinci (Kindle Location 2005). Simon & Schuster. Kindle Edition. Isaacson, Walter. Leonardo da Vinci (Kindle Location 7073). Simon & Schuster. Kindle Edition. Isaacson, Walter. Leonardo da Vinci (Kindle Location 7676). Simon & Schuster. Kindle Edition. Isaacson, Walter. Leonardo da Vinci (Kindle Locations 7641-7642). Simon & Schuster. Kindle Edition. Isaacson, Walter. Leonardo da Vinci (Kindle Locations 7615-7616). Simon & Schuster. Kindle Edition. Isaacson, Walter. Leonardo da Vinci (Kindle Location 7182). Simon & Schuster. Kindle Edition.